February | 2015 | The Loudest Librarian! I apologize for the long hiatus from the blog. Our library actually had a storytime break for the last couple of months because our schedule of open hours is changing. I was so happy to be back doing storytime tonight, and seeing some of my regular families, plus some new faces. And I was especially excited to share this year’s Caldecott Award-winning picture books. I had suspected that this book would not win the Caldecott, if only because Jon Klassen already won the award two years ago for This is Not My Hat. But I love to read it aloud. I shared it with two second grade classes a few weeks ago, and I felt like a rock star while I was reading it. It’s the story of two boys and a dog who set out to dig until they find something spectacular, and although they miss several spectacular somethings along the way, something quite extraordinary happens to them at the end. Spoiler alert: you have to pay attention to the trees and the flowers on the first page to realize that Sam and Dave end up someplace slightly different from where they started. The second-graders I read to were practically screaming with frustration whenever they saw the massive gemstones that Sam and Dave somehow always manage to dig around and never find. The kids at family storytime weren’t quite as loud, but they were still absorbed and excited. This was the actual winner of this year’s Caldecott Award. I started by asking the kids if they had an imaginary friend, or knew someone who did (my mother once had an infamous imaginary friend named Jelly, who caused so much trouble that her sisters used to plot to kill him). One girl at storytime shared that she had an imaginary sister named Serena. The book opens in the land of imaginary friends, where lots of unusual creatures wait to be claimed and named by a real child. One of them is the creature who will eventually be named Beekle, but first he has to set off on an adventure to find the child who will be his friend. 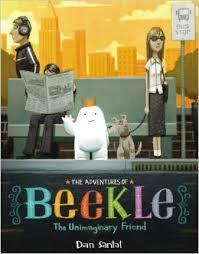 I love Beekle’s reaction to “the real world” a place where only grown-ups are eating cake, no one stops to hear the music, and everyone needs a nap. The kids I read this too all loved the different depictions of imaginary friends: one shaped like a puzzle piece, one like a drum, one like a snake, etc. Great fun to read, with colorful, imaginative illustrations. This is one of my favorite picture book biographies. 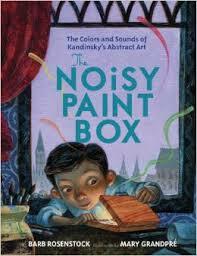 It tells the story of painter Vasya Kandinsky, who was a proper Russian boy until his aunt gave him a box of paints. 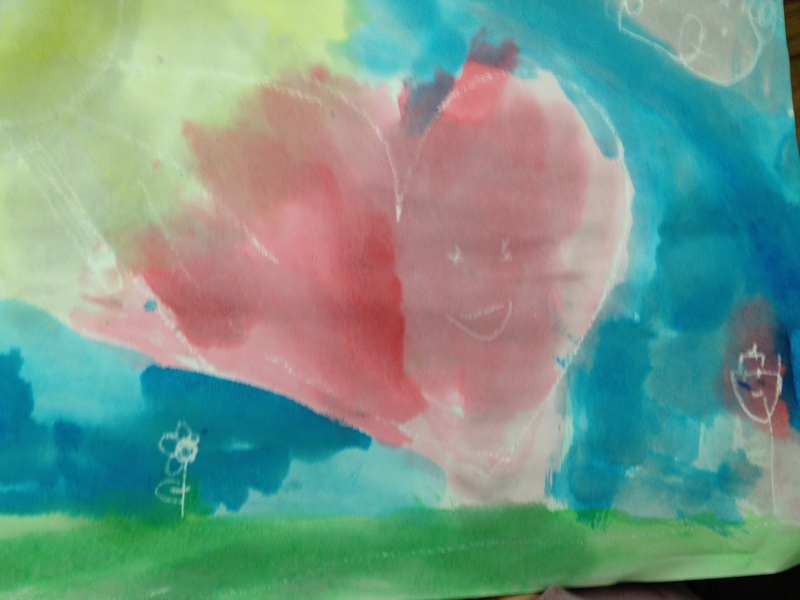 To Vasya’s surprise, the colors make sounds, a music that no one else seems to hear. And while he tries his best to be proper, in the end he is driven to try to paint the music he hears and how it makes him feel, leading to the birth of abstract art. The author’s note at the end says that Kandinsky may have had synthesia, a condition that causes people to feel one sense in response to another. These people may hear colors, smell numbers (imagine what math classes would be like? ), or even taste words. The kids were entranced by that idea, and they loved the photos of Kandinsky’s art at the end. One girl snatched this book up, and sat clutching it tightly for the whole rest of the storytime. Sweet story about a little boy who finds the city where his Nana lives frightening and loud, until Nana shows him all the wonderful things they can do there. This was an interesting book to read aloud, considering that our library sits in a quiet suburb of San Francisco, a city most of the kids have probably visited often. Some of them made a point of saying that they didn’t consider cities frightening. As a former farm girl though, I can relate to the boy’s fears, and his nana reminds me of my great-aunt Hazel, who loved living alone in her Manhattan apartment until a fractured hip forced her to leave New York shortly after her 90th birthday. I always admired her, and I admire the Nana in this story. 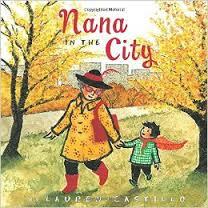 This would be a lovely book for a theme about grandparents. Yuyi Morales also won the Pura Belpré Illustrator Award for this book. The text is very simple, with only one or two words per page in both English and Spanish. 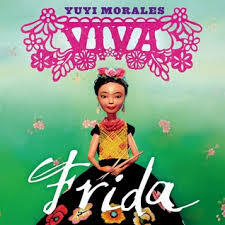 The kids loved the illustrations, which are magical and engaging, evoking the art of Mexican artist Frida Kahlo. 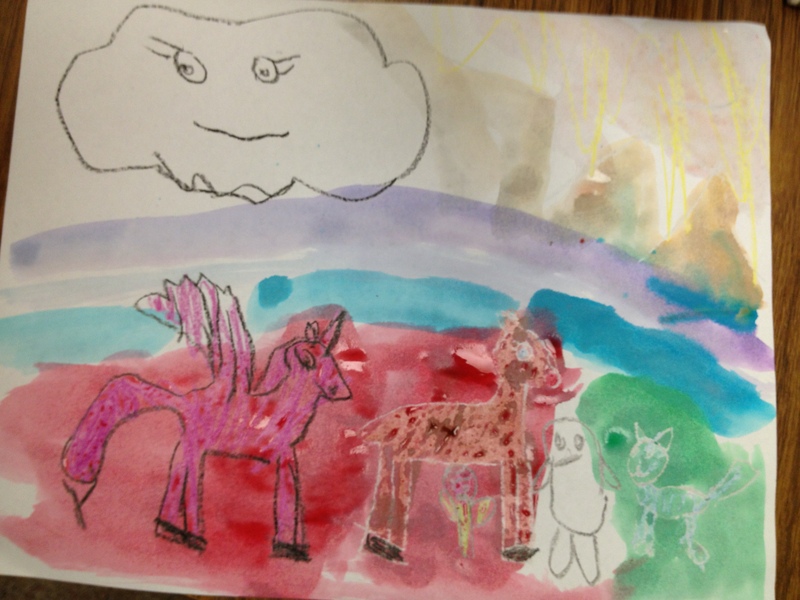 After I read the books, I asked the kids to guess which one won the actual Caldecott Award. 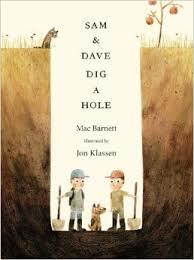 All the books got several votes, although Sam and Dave Dig a Hole had slightly more. When I did this with the two second grade classes earlier in the day, I threw in a couple of books that weren’t Caldecott winners at all: You Are (Not) Small by Anna Kang and Christopher Weyant, which won this year’s Theodor Seuss Geisel Award; and My Teacher is a Monster (No I Am Not) by Peter Brown. Funnily enough, their favorite was My Teacher is a Monster. He likes to eat my peas. Like shiny coins and keys. In a matchbox filled with hay. And scares bad dreams away. And play throughout the day. He’ll be with you till the end. Is as blue as blue can be. It’s as blue as blue can be. Is as green as green can be. And the sky is blue as blue can be. Are as yellow as yellow can be. They’re as yellow as yellow can be. And the grass is green as green can be. 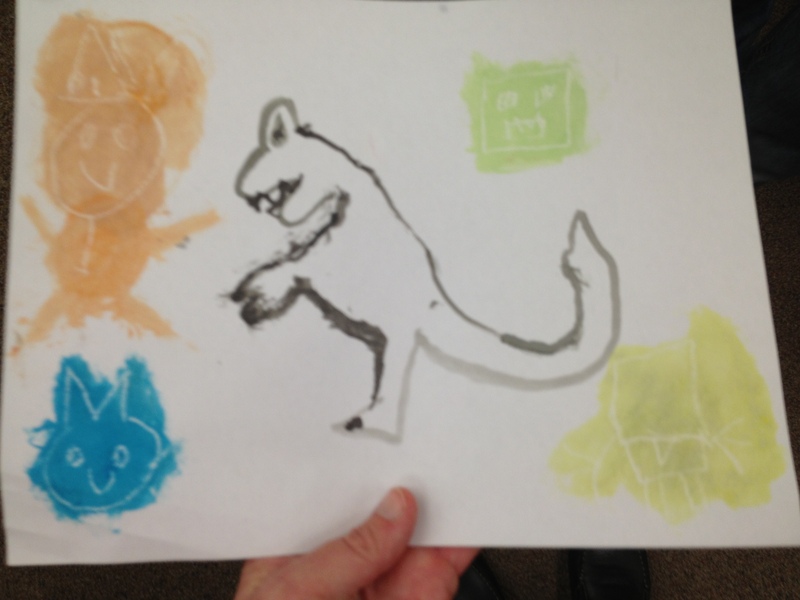 Although I didn’t have enough time to share this one at Family Storytime, I did read it to the second graders. It describes the life of Peter Roget, who was obsessed with making lists. It was a good opportunity to describe what a thesaurus is (most of them had never used one, and one student guessed it was a kind of dinosaur). I think it’s hard for kids growing up today to conceive of a world without the Internet and Google, the electronic realization of Roget’s dream of having all knowledge in one place. I didn’t share this one at all, because it’s a lengthy graphic novel intended for Young Adults, and I haven’t had a chance to read it myself, but I wish I had been able to at least show it to the kids. Graphic novels are so popular right now. Most of the book requests I get at work are for series like Smile, Big Nate, and Amulet. I’m a big believer in comics and graphic novels as a way to hook kids on reading (for more on that see my post: My Love Affair with Superman), so it’s nice to see a book in this medium receive a prominent award. It was also chosen as an Honor book for the Michael L. Printz Award for Young Adult Literature. Which of the Caldecott Award winners do you like best? Or would you have picked a different book entirely?